Not much has been happening, besides me riding the struggle bus through the land of nausea. Today we got to see the baby! 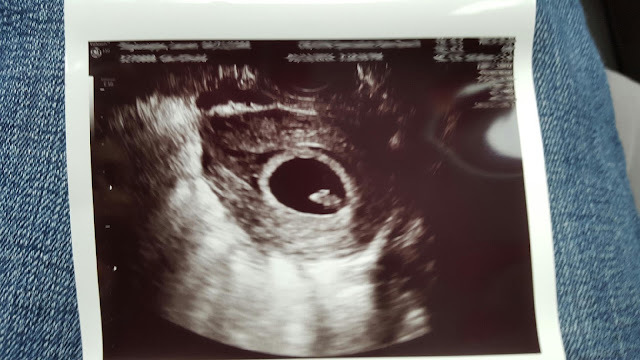 We had the confirmation ultrasound, but it was so early at that point that nothing could really be seen. I've spent the past week and a half worrying, due to some issues I was having, so I was really anxious for this appointment today. Turns out, everything looks good, there is no bleeding, and Baby Mazz has a strong heartbeat of 154, which we got to hear. I am 7 weeks 3 days, which is exactly what I thought. So... baby is due August 28th. I can't WAIT to be super pregnant during the extreme heat and humidity of Florida summer! THAT'S MY UTERUS RIGHT THERE! WITH A LITTLE FETUS IN IT! My body is growing a real-life HUMAN BEING!